Greeley Avenue Bar & Grill are once again making a name for themselves. A few weeks ago we mentioned GA placed number 7 on Buzzfeed for “The 30 Most Portland Things That Have Happened In Portland.” GA has brought Bacon Mondays to the grill, making everyone’s Monday is a bit more tolerable. With each beer or cocktail ordered, you receive a free slice of bacon. If you missed the buzz, click here. Have you visited Greeley’s new website? You can now view full menus, and don’t forget that a new appetizer, lunch and dinner special are available every day. I don’t know how many times I’ve gotten home, looked in the fridge and nothing looked good to eat. Now you have another option of hopping down to Greeley, kicking back, and letting someone else make you dinner. With Chicago and Pittsburgh, and Boston in the top five spots, the NHL is moving forward into April and in a few short weeks the season will end. Then, it’s all about the Stanley Cup playoffs. There’s talk of the Jets pushing towards playoffs, and several other teams reaching for that same goal. Here’s the schedule for your upcoming Thursday and Friday. Don’t forget to join us Tuesday nights for Texas Hold ’em at 7:00 p.m. and Trivia, Wednesday nights at 6:00 p.m. There’s always something good at Greeley Avenue, so have a great week, and we’ll see ya there! 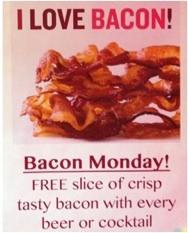 This entry was posted in Entertainment and tagged & grill, bacon, Bacon Monday, bar, bar & grill, buzzfeed, NHL, NHL Playoffs 2013, restaurant portland or, stanley cup, what is bacon by greeleyave. Bookmark the permalink.